If you haven't guessed, the Ocean Clans live at the Sun Drown place. They have lived here for generations, but originated from the first four clans. (Thunderclan, Windclan, Shadowclan, and Riverclan) Somewhere along the way, the names changed, but the clans are basically still the same as far as ceremony and such go, but I should probably give you a run-down on the territories. Bluffclan- They live in the forest on the bluff above the part of the beach where Waveclan resides. There is a small part of the beach called the stone sand, where the beach is particularly stony. 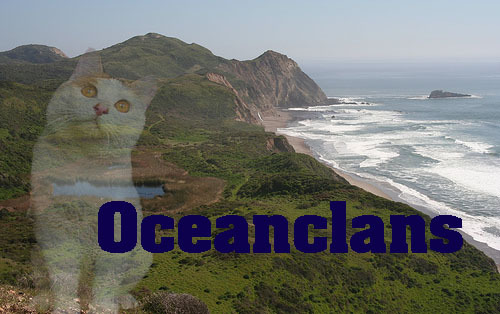 This belongs to Bluffclan, and it is the only access they have to the ocean. Coralclan- They live on an small, wooded island just off the shore, directly across from Waveclan's portion of the beach. The island has a sandbar that skirts it all the way arounf, and there are large boulders in the water that they jump across when they need to get to the shore for gatherings. Waveclan- They live on the beach beneath the cliff where Bluffclan resides. Their camp is a system of caves at the base of the cliff, and all of their territory is beach except for the caves and a small patch of woods just off the sand at the edge of the sand, that Bluffclan granted them so that they would have better hunting. Gullclan- They live on the far side of the beach, bordering Waveclan territory. There is are an excessive amount of Gulls on their section of the beach. NOTE: Feel free to add to these descriptions in roleplay, but after doing so, please post here to inform me so I can update them.